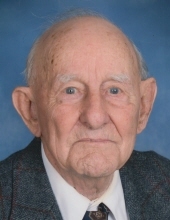 Henry Otto Boedeker, age 95 of Lowden, passed away on Thursday January 31, 2019 at Wheatland Manor Nursing Home. Funeral services will be held on Monday February 4 at 10:30 A.M at Zion United Church of Christ with Pastor Stephen Stepp officiating. Burial will follow at the Van Horn Cemetery. Visitation will be held from 9:00 A.M until service time at the church. Henry was born on September 12, 1923 in rural Lowden, son of Deitrich and Mary (Deerberg) Boedeker. He married Shirley Jean Schilling on December 20, 1947. Henry served in the Army during WWII and returned home to farm. He retired in 1989 after 43 years. Henry was a lifetime member of Zion UCC, where he was baptized and confirmed, and served two four-year terms on the church council. He was a 50-plus year member of the Lowden Lillis Deerberg Legion Post 366 and was also a Springfield Township Trustee for many years. During his lifetime he enjoyed farming, feeding cattle, and raising & feeding hogs for market. Henry and Shirley loved taking trips to Colorado and the mountains. He enjoyed playing cards, gardening, woodworking, doing puzzles, visiting with his neighbors and spending time with his family. He is survived by daughter, Linda (Allen) Behrens; son, Dennis (Cheryl) Boedeker; grandchildren, Dean (Mandi) Behrens, Annette Behrens, Brian (Amber) Boedeker, and Brad (Natalie) Boedeker; 10 great grandchildren; sister, Betty Baal; sister-in-laws Carol, Phyllis, and Eunice Boedeker; brothers-in-law Walt (Fern) Schilling and Bill (Selma) Schilling; and many nieces and nephews. Henry was preceded in death by his parents; wife, Shirley in 2001; siblings, Paul, Milda (in infancy), Chris, Richard, Donald and Norman Boedeker; brother-in-law Bud Baal; and sisters-in-law Helen (Jack) Dohrmann and Betty (Bill) Lee. To plant a tree in memory of Henry Otto Boedeker, please visit our Tribute Store. "Email Address" would like to share the life celebration of Henry Otto Boedeker. Click on the "link" to go to share a favorite memory or leave a condolence message for the family.